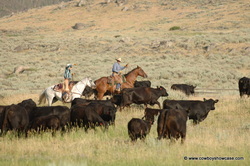 Stan and Mary Flitner’s Diamond Tail Ranch, near Shell, Wyoming, carries on a family cattle-ranching operation that has been in business for since 1906. Five generations of Flitners have taken care of their land and livestock and handed the reins on to the next generation. 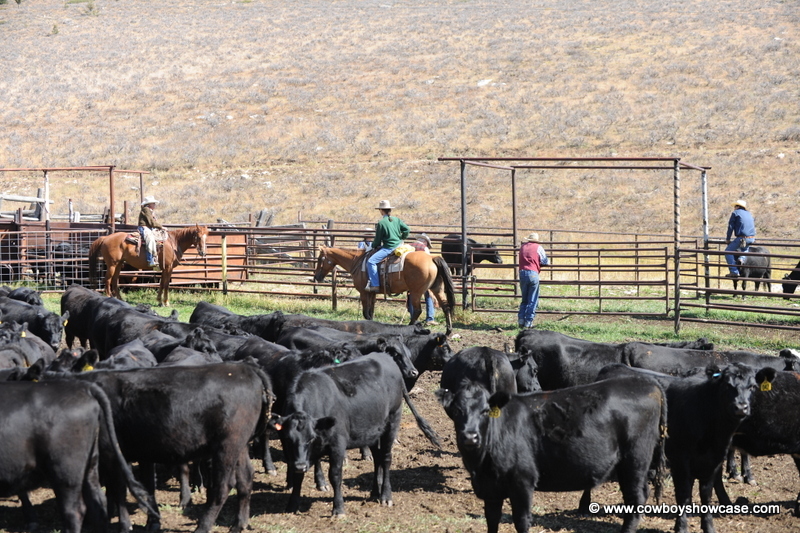 Cattle ranching for a profit is not easy. Each day brings new challenges. These two Wyoming natives have persevered despite all of the obstacles of the 21st. century such as unreasonable government regulations, low cattle prices, dry years, cold winters, and high gas prices. Stan and Mary’s daily lives revolve around taking care of their ranch, their livestock, and their family. Their goal is to maintain and preserve for generations to come what was started over 100 years ago. Arthur Flitner, Stan’s grandfather, came into Shell Valley, located in Big Horn County, on the west side of the Big Horn Mountains in 1906. 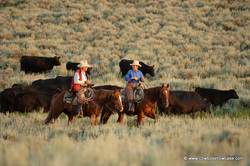 He bought 160 acres of private land, 160 head of cattle, and the Diamond Tail brand and started his ranching operation. Since then, the ranch has grown to over 4,000 deeded acres, 30,000 acres of BLM, and 6,000 acres of USFS leased grazing lands. It runs several hundred head of cattle and horses. Stan and Mary Flitner met and married while they were both attending college at the University of Wyoming, in Laramie. 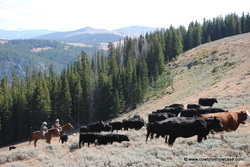 Mary’s family, the Budd’s, are a well-respected old-time Wyoming livestock family from the Big Piney area. 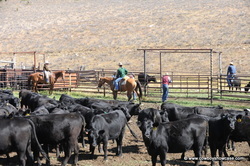 The Flitners operate the day-to-day ranching operation today with their son Tim Flitner, his wife Jamie, and their two children. Stan says, “We have been dead broke two or three times in the past years but somehow we survived.” When asked how do you survive making a living ranching in a world where 98.5 percent of the people in America live in an urban society with no idea where a T-bone steak comes from before it arrives in their local grocery store, Stan said, “With less than one and a half percent of the total US population producing food and fiber you need to attempt to get the word out to the world what you are trying to accomplish.” Stan and Mary have attempted to do just that. Stan is a past State President of the Wyoming Stock Growers’ Association. This organization has, for over 125 years, promoted livestock production worldwide. During his term as Stock Growers’ president, Stan made numerous trips around the country and to Washington, D.C. to meet with elected officials and others promoting the livestock industry. Mary was appointed by former Wyoming Governor Sullivan and served six years on the Wyoming Game and Fish Commission advising and conferring with State Fish and Game biologists and other interested parties about wildlife/livestock issues. Stan and his family before him had spent countless hours working to restore an oxbow along a creek near the ranch headquarters and even more time creating wetlands in adjacent areas. Stan said, “We had been trying to drain this swamp for three generations. I started worrying when I no longer was seeing frogs. I figured that if a frog can’t swim in this marsh there was something wrong.” Stan subsequently created fifteen acres of healthy wetlands in cooperation with Wyoming’s State Fish and Game, U.S Fish and Wildlife Service and the Natural Resources Conservation Service. A myriad of bird and animal species and frogs are once again using this wetlands area. Mike Laughlin lives on a ranch in the Ruby Mountains near Lamoille, Nevada. He takes in pasture cattle; day works for ranchers, and writes.